Of Long Island's native maples, the most common species is the red maple (Acer rubrum). The sugar maple (Acer saccharum), the legendary tree of fall foliage and late-winter sugaring, is also considered native to Long Island but was never particularly common and is now extremely rare in the wild. More appropriately, in the few locations where it may still occur naturally it is considered a "relict" species. Two other species of large maples that are frequently planted as shade trees, the Norway maple (Acer platanoides) and the silver maple (Acer saccharinum) are not native to Long Island. The Norway maple is a native of Europe, while the silver maple grows naturally in places to our west, such as in the Ohio Valley. 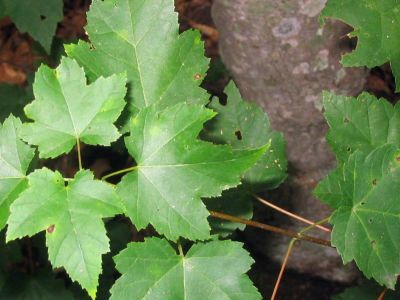 There are many other maple species widely used in landscaping on Long Island, most as ornamentals, but this article will discuss the four large shade trees mentioned above, including some of the important traits of each that should be of interest to Long Island gardeners and a few tips to help with the identification of these trees. Because they do not tolerate lengthy periods of summer drought well, the original distribution of sugar maples on Long Island was probably confined mainly to moist woods found along parts of the north shore as well as over the western and eastern ends of the island. These trees would have had difficulty in becoming established in the well drained sandy soils that cover much of Long Island, particularly in the pine barrens and along the south shore where the soil tends to dry out rapidly after a rainfall. The stunted growth often found in many of the pine barrens species is in fact partially due to this simulated "arid" climate that can even exist during summers with normal rainfall. It is only one of the factors behind the growth patterns in the pine barrens, where the impact of naturally recurring fires is generally regarded as the primary factor, but the type of soil is also a contributing factor. Over time, these trees have been disappearing from more favorable sites due to a combination of the warming climate and human settlement. Sugar maples reproduce best in a cooler climate than is currently found on Long Island because the seed need more sustained freezing temperatures during the winter to insure better viability. However, they still do reasonably well in areas to our southwest that are considerably warmer than Long Island. Another factor that probably also contributes to the rarity of these trees is their susceptibility to disturbances of the soils that they grow in and restrictions on their root growth, such as those caused by construction, road building and other development activities. For this reason, they usually make a poor choice as a street tree on Long Island. The Norway maple looks similar to the sugar maple but it is inexpensive and easy to cultivate. Norway maples grow rapidly, and in their early years are somewhat more tolerant of most of the difficult environmental conditions that exist along the sides of roads, the main exception being road salt which is damaging to all maples. Their tolerance of air pollution and the fact that they grow relatively well in confined planting locations makes them a popular choice for planting along city streets. Partly for these reasons the Norway maple has often been the maple of choice, although usually not the best choice, for many Long Island builders and home owners. Another reason that the Norway maple is the most over planted tree on Long Island, if not in the country, is that it is usually sold to the exclusion of its native cousin at large chain stores, including the ubiquitous home stores, variety chains and garden store chains. 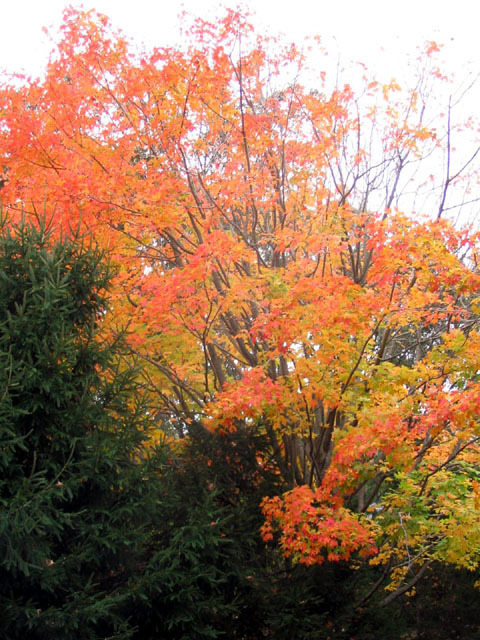 Sugar maples are more typically available through nurseries that tend to be frequented mainly by local landscaping contractors, rather than by the general public. However, although less common than the Norway maple, sugar maples are still used frequently in landscaping. In the earlier stages of their life cycles, Norway maple and sugar maples can be difficult to distinguish from one another. The bark of young trees is similar and the typical five lobed leaves are often very similar. 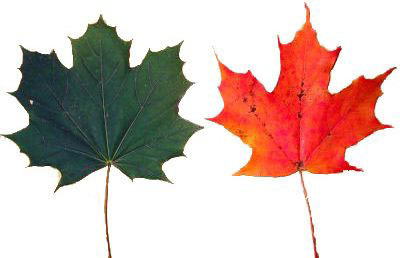 In the photo above right, the green leaf on the left is from a Norway maple and the red leaf on the right is from a sugar maple. Both leaves were collected on the same day in mid October from two trees growing next to one another. As the photo above implies, there are differences in the fall foliage. The Norway maple leaves tend to change colors significantly later during the autumn than do the leaves of the sugar maple, which is famous for vivid displays of reds, oranges and yellows. By contrast, the Norway maple leaves turn primarily to a uniform pale yellow color, typically after many other trees in the landscape are bare. Some years the display of yellow can be more distinctive and it also prolongs the presence of color in an other-wise barren landscape during the latter half of November, but the late dropping of the leaves of the Norway maple also prolongs the raking and yard clean-up season for homeowners. Although the photo above shows some differences (for example, the length of the central lobe of the leaves), the leaves of individual trees of the two species can be remarkably similar. When in doubt, a more foolproof method of identifying a Norway maple during the growing season is by removing a leaf and observing the white sap that oozes from the broken leaf stem as shown in the photo at left. The leaves of the sugar maple do not show any visible sap when they are removed from the tree. Outside of the growing season, telling young trees apart can be tricky. Both have a similar smooth grayish brown bark. As the trees grow and age, the bark of the Sugar maple becomes scaly...in large plates, while the bark of the Norway maple develops distinctive vertical furrows. The photo at right depicts the bark of a medium sized sugar maple (on the left) and a Norway maple (on the right). Both trees make excellent shade trees. The Norway maple tends to exhibit more spread in the crown, especially as it ages. 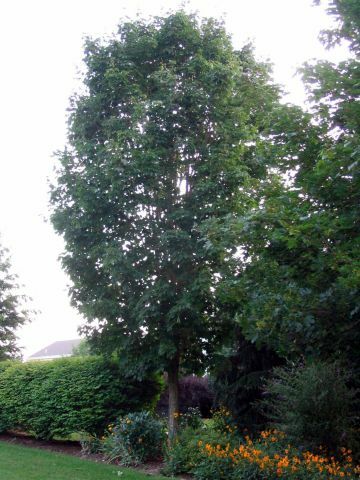 The shade cast by a mature Norway maple is so dense that it contributes to making it very difficult to maintain a lawn under the tree. This is due not only to the dense shading provided by the tree, but also in large measure to the dense mat of roots that radiate far from the trunk just below the surface. These roots are the main reason why the Norway maple is more tolerant of summer drought, but they are so effective in pulling moisture from the soil that they leave little for the thirsty turf grasses usually planted in suburban lawns. Sugar maples are slower growing and more deeply rooted and are more permissive in terms of allowing lawn grasses to be cultivated beneath their branches. The Norway maple is usually not a good choice for Long Island. Another factor that gardeners should consider is the Norway maple's ability to reproduce on Long Island. The trees produce tremendous numbers of seed contained in wing shaped fruits called samaras which sprout very easily. In the spring, the multitude of Norway maple sprouts in lawns and gardens can create a weeding problem for the home owner. Perhaps more significant, is their propensity in certain habitats to quickly out complete and take over from native species. The high rate of germination, fast growth in a variety of conditions and dense shade can quickly overwhelm slower growing native species in empty lots, abandoned fields and cleared areas either bordering or contained within native woods. In many such areas they have already formed pure dense thickets of Norway maples and in some locations they have made inroads deeper into the native woods. For this reason alone, the planting of this species on Long Island should be strongly discouraged. Furthermore, the Norway maple seems more susceptible to certain diseases, such as Verticillium wilt, a fungal disease that kills branches and frequently entire trees. This disease attacks many kinds of trees and shrubs, including other maple species, but appears to be most common on Norway maples. 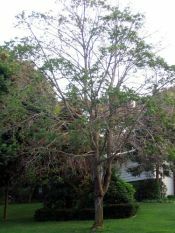 The first sign of the disease is usually the appearance of dead branches on the trees. Verticillium wilt is difficult to confirm without laboratory diagnosis of infected wood, but may be responsible for the high death rate among Norway maples on Long Island, particularly those in more stressful (i.e., curbside) environments. The tree shown to the right, which has been marked for destruction, is one of many relatively young Norway maples in the Smithtown area that are failing rapidly, or have already died. On the left is the massive trunk of a Norway maple located in Oyster Bay. This impressive tree appears to have been well cared for and still looks fairly healthy. However, the fairly substantial vine growing out of the crook between two of the massive limbs could be an indication of some rot within the tree. Such a tree should be monitored and periodically inspected by a professional to monitor it's condition. 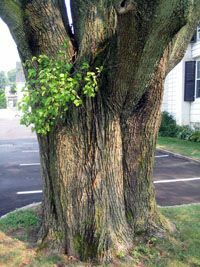 This advice holds for any large old tree, but helps to make a good point here, since Norway maples growing in less favorable conditions along Long Island roadways tend to enter a state of decline at a much younger age than the old veteran pictured. On many local roadways, declining Norway maples of 40 or 50 years of age and sometimes younger pose a potential danger to motorists and pedestrians. Those taking a long term view of their plantings should consider this when selecting street trees. 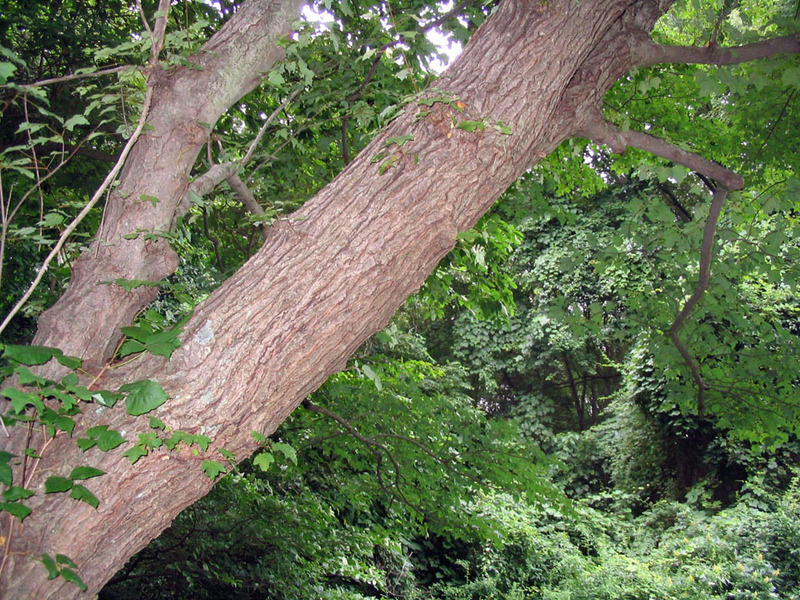 Click the image for a close-up of the plant (a vine of the invasive species, Asiatic Bittersweet) that is rooted into the Oyster Bay maple's trunk. Another problem that sometimes afflicts Norway maples is the tendency of the fast growing roots to encircle the tree just below the surface. This "girdles" the tree restricting the flow of water and nutrients and weakens or kills many transplanted trees at a young age. The Sugar maple is not always a good choice either. Although the sugar maple compares favorably in terms of many of the characteristics where the Norway maple is problematic (and provides the added benefit of spectacular fall color), its susceptibility to summer drought and compaction of the soil makes it unsuitable as a street tree as well as in locations where soil moisture is often lacking during the summer. In moist soils or consistently irrigated landscapes it can do quite well and may prove to be a pleasing addition to the landscape. This is especially true for larger properties, if you take a long term view, since sugar maples can become quite large trees over time. The red maple is very common in the woods on Long Island. Although it is most commonly found in and near wetlands, it is known to thrive in the widest variety of conditions of any of the maples described here, including drier habitats. It may be the best choice among the maples for Long Island where a large shade tree is desired. It is neither as drought sensitive as the sugar maple, as requiring of moist soil as the silver maple, nor does it have the lawn-choking root system of the Norway maple. Furthermore many red maples present as memorable a display of fall color as do the sugar maples. On the downside, there is great variability among the color display presented by individual trees and it is difficult to know how the fall color will be until after the tree has been planted. This can be mitigated by selecting cultivars known to have more predictable fall color characteristics. Red maples are also more tolerant than the sugar maple of road-side conditions including air and soil pollutants (with the exception of deicing road salt) and root zone restriction. However, like other maples, the effect of multiple environmental stresses will weaken trees and thus they may do poorly as a street tree along heavily traveled roads. This is typically not a problem on quieter roads in subdivisions, although care should be taken not to plant maples of any kind where they will be prone to splash over from road salt during the winter months. Salt accumulates in maples and seriously impairs their ability to take up water during hot dry weather. Red maples typically grow at a moderate rate; slower than Norway or silver maples but faster than sugar maples. In ideal conditions, they can grow relatively rapidly. Red maples grow natively over the widest range of any of these species and can be found from Canada to south Florida, therefore it is very important to plant trees that come from northern nursery stock. Southern trees may not be winter hardy or may have other undesirable shortcomings in our climate. Ideally, red maples planted on Long Island should be grown from local stock. There are a few nurseries on Long Island known to have propagated red maples from local stock, but you may have to call around to find one. Although currently out of print, the book "Long Island Native Plants for Landscaping" (Karen Blumer, 1990) may be available in your library and is still an excellent resource for locating native plants at local nurseries. Silver maples are not native to Long Island, but have been widely planted because they grow very rapidly, are inexpensive and transplant easily. The spreading limbs of larger trees, often somewhat vase-shaped, can be quite attractive. The leaves are easily distinguished by the deep lobes and the silvery color of the underside of each leaf. There are some fine examples of these trees to be found on Long Island but for the typical Long Island residence as well as anywhere near paved surfaces, they are an inappropriate choice. 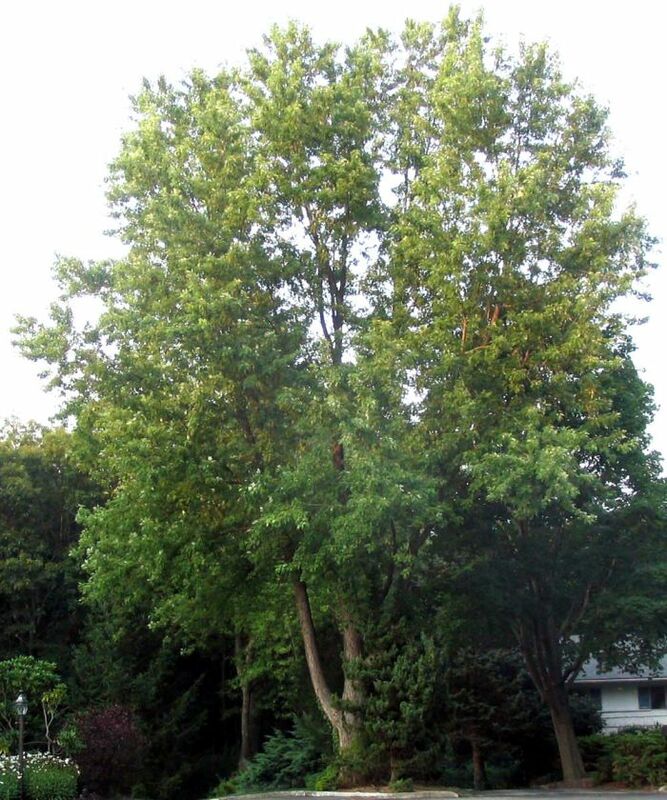 There are a number of reasons why the silver maple might not be suitable for a given location, but one of the big drawbacks of these trees is the weakness of the wood which makes the limbs prone to breaking in high winds, especially the larger limbs. This makes them potentially dangerous in residential and road side settings. The growth habit of the roots is also problematic. The proliferation of large feeder roots around the tree makes them prone to cracking adjacent side walks. In its native environment, the silver maple is found mostly in and near wetlands and areas that are seasonally wet. 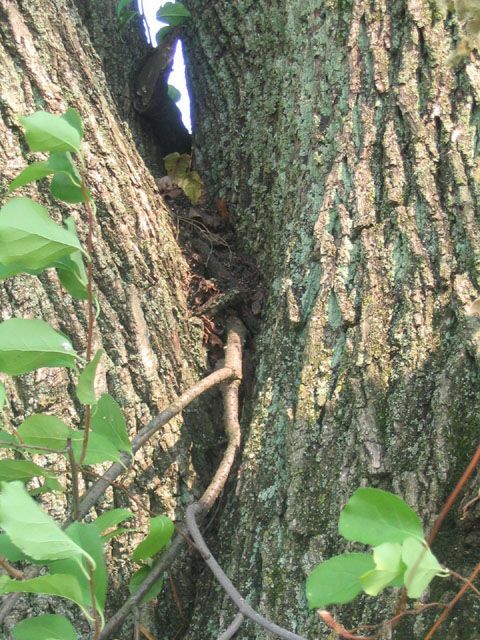 The roots of the silver maple tend to seek out water quite aggressively and are known to grow into and clog drains and sewers if planted close enough. In spite of all of this, as with the limbs, the roots are also quite weak and silver maples will also uproot more readily in high winds than other trees. 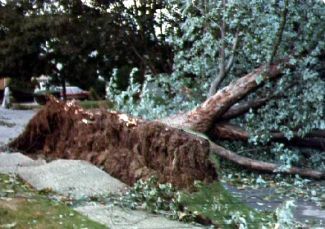 The uprooting of silver maples with tremendous complexes of roots has provided some of the more memorable images of damage from some relatively weak hurricanes that have struck Long Island in the past. They can be large attractive trees in the proper setting, for example in an open area with consistently moist soil, but should be kept well away from man-made structures and paved surfaces. 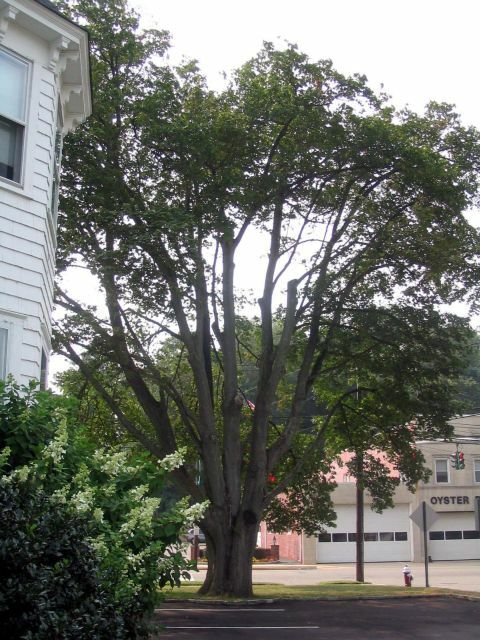 It is generally too large a tree for the lots that most Long Island homes are built on and the problems of weak wood are exacerbated in locations outside of the type of wetlands that the silver maple grows in its native habitat. In general this tree should be overlooked in favor of more suitable species for planting around Long Island residences. The roots of this silver maple caused severe damage to the sidewalk. In an attempt to prevent further damage, the homeowner had cut out the offending roots. This was among the first trees to topple as Hurricane Gloria approached Long Island. While each of these four maple species has their own strengths and weaknesses, there are certain rules that should be kept in mind when planting any of them. Plant at least 10 feet from paved surfaces such as streets and sidewalks. There are plenty of good reasons to observe this rule, for example, all maples are salt sensitive, sugar maples do poorly where pavement confines their roots, and the fast growing roots of silver maples are very destructive to pavement. All four of these species should be avoided for use in the three foot wide strip of dirt often found between the sidewalk and the street in residential areas. Do not plant where salt is likely to be spread on the ground during winter storms. In locations where this is likely to happen, the further from the street that the tree can be planted, the more the impact will be reduced. In curbside locations where road salt is used and snowplows push snow while traveling at a decent speed, a 10 foot setback may not be sufficient. 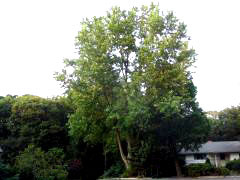 Because they will grow quite large over time, plant these shade trees at least 25 feet from houses and other buildings. Also consider the long term impact on gardens and other areas when deciding where to plant a shade tree. Plant the trees in well drained, but not overly dry soil. Maples need a steady moisture supply, but generally, do not like to get their "feet wet" for extended periods of time. Even the red and silver maples, which are often found naturally in wet areas, seem to prefer better drained soils. Whenever possible, plant trees that were grown from local native stock. Trees that grow over a wide geographic area tend to adapt to the prevailing conditions in the regions where they grow. For example, red maple trees brought from the deep south would have a very low likelihood of success if planted on Long Island. Avoid injuring the bark of the tree. Injuries to the bark weaken the tree and often provide the entranceway for diseases that eventually kill a tree. Such injuries to trees growing near lawn areas are frequently caused by running a lawn mower into the trunk. Damage to the bark caused by automobiles is a key contributor to the poor performance of many street trees.